Hello I have a small fresh water aquarium, based on a local Irish landscape. I have a bonsai tree which is growing out of dragon stone, similar like the bend trees around Irish Sea. Green grass is like meadow for ship and bucephalandra wavy leaf is like holy tree. In the aquarium currently I have neons tetra with blue and red shrimps. 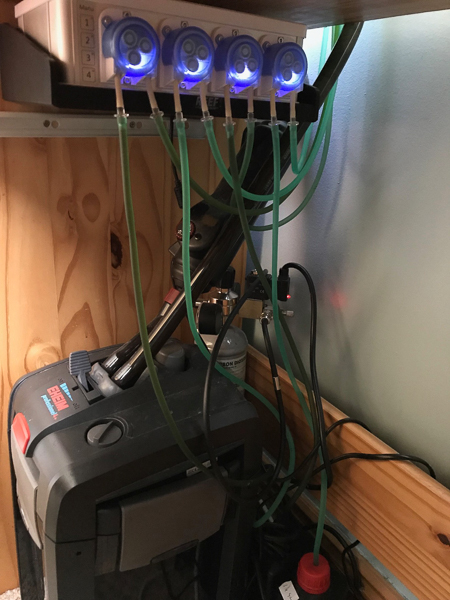 Why I chose GHL equipment for my aquarium? 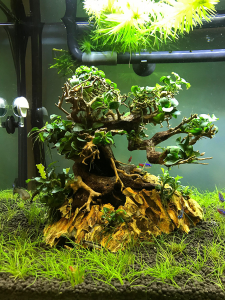 Firstly I got GHL doser 2.1 SA as for my small aquarium I need to dose very small amounts of fertilizer. The 0.1ml accuracy was the key point. Then I read over internet that the Mitras LX is currently the only good light for SPS corals which I am planning to keep in my reef aquarium. So I got LX6300HV and LX6100HV. Having them I wanted to control the aquarium by computer so I bought P4 ultimate with extra floats and sensors. 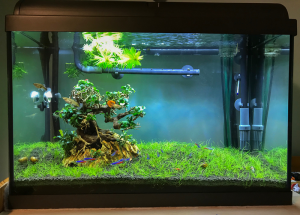 I can see a bright future for Mitras Slimline if I win them for the reef aquarium, as diamond shape of the tank will require additional lights and Mitras Slimline would fit perfectly.